The Town of Warrenton, Virginia, purchased a 65-acre site along Warrenton’s western edge to develop a family aquatic/recreation facility for its citizens. The new $22-million 50,000 sq. 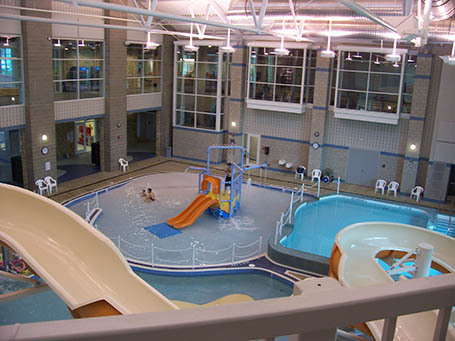 ft. facility encompasses a full-size gymnasium, natatorium, weight and exercise rooms, walking track, and a fitness center. The exterior of the building was themed with agricultural aesthetics, using multi-colored brick, a metal barn-like roof, and a silo-inspired main entrance. The team of Grimm + Parker and Counsilman-Hunsaker brought their aquatic design expertise “to the drawing boards” and developed a cutting-edge aquatic facility to be utilized by the community for many years to come. The natatorium consists of two large pools that sit side by side, separated by a glass wall that provides both visual transparency and acoustic separation. This allows for different user groups to occupy the facility simultaneously, with water and air temperatures adjusted accordingly. Integrated into the wall is the lifeguard and first-aid station, affording clear views to both pools and decks.